The Milford Historical Society invites you to participate in the 2014 Independence Day Parade. Our Parade will be held at 11:00 A.M. on Friday, July 4rd. As you know this Parade is an opportunity for business and individuals to “Toot Their Horn” and show community spirit at the same time. The Parade will begin in downtown Milford and end at Huron Street. Participants can begin staging in designated areas by 10:00 A.M. Below is a link to the Application for the parade. Please complete and send or fax back. We ask that your float, music or demonstration somehow relate to the theme through the use of colors, etc. To participate in this year’s Parade, please fill out the attached form and return to the address below, with a stamped, self-addressed envelope so we may mail back to you your assigned parade spot. We will be mailing back to you, in the envelope you have provided, confirmation of your placement in the Parade. If you have any questions, or require additional information, please feel free to contact me. 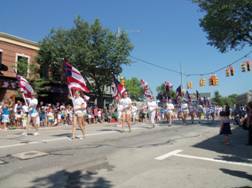 The Milford Historical Society Independence Parade is an entertainment event. great country where we live. walking along side should help with keeping children from stepping in front of the vehicle and getting injured..
* The Parade line up will be mailed or e-mailed about a week before the event..
We ask that each participant respond by phone, E-mail, etc. that they have received their Parade Spot Number at that time. issues Naturally, no alcoholic beverages or banned drugs are allowed. at the parade viewers. Michigan State Law prohibits throwing items in a parade. Please hand these items to the parade participants. We don’t want anyone hurt while running into the traffic to pick up items off the ground. * Please do not leave any large gaps between your float and the one in front. parade. We suggest no more than 20 feet exist between each exhibit. along the route to assist and answer any questions that arise. properly trained to be among people while leashed, ridden, hooked up, etc. Click here to get the parade application. Print it out and return it (see address above) or Fax it in (248-684-0070) to reserve your spot in the 2014 Independence Day Parade on July 4th. This entry was posted on Sunday, June 15th, 2014 at 12:11 pm and is filed under About Milford Michigan, Local Events. You can follow any responses to this entry through the RSS 2.0 feed. You can leave a response, or trackback from your own site.